Objectives: Though diaphragmatic hernias have been recognized for centuries, their pathophysiology is still widely debated. 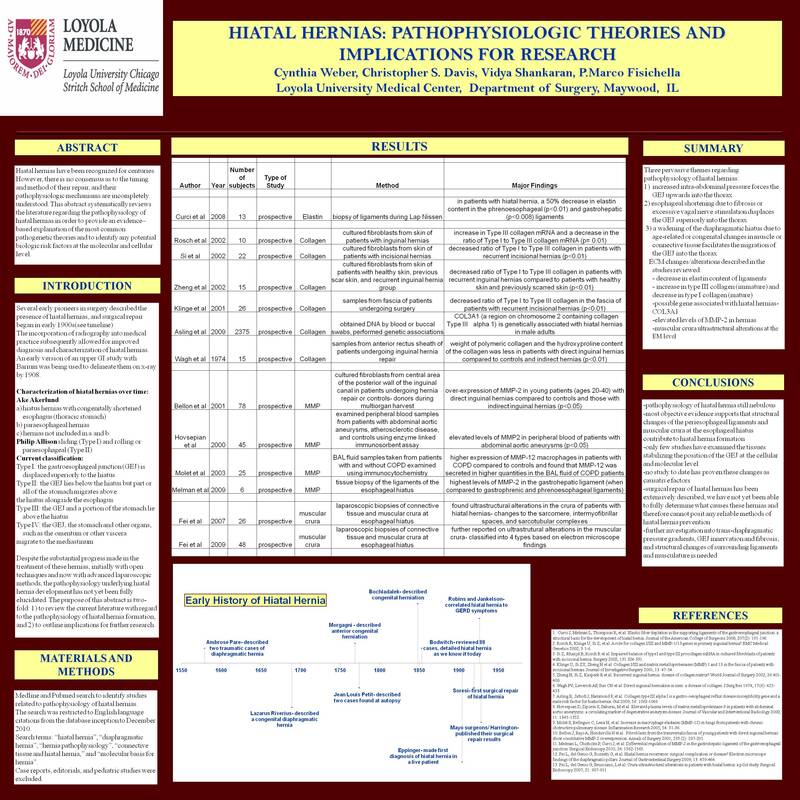 The purpose of this study is to review the current literature regarding the pathophysiology of hiatal hernia development and outline implications for research in this field. Methods: We performed a systematic search of the Medline database to identify studies relating to hiatal hernias. The searches were restricted to English language citations from the database’s inception to September 2010. Search terms included, “hiatal hernia”, “diaphragmatic hernia”, “hernia pathophysiology”, and “molecular basis for hernia”. Relevant papers from selected articles’ reference lists were also identified and used in this review. Case reports, editorials, and pediatric studies (patients <18 years of age) were excluded. Results: There appears to be three predominant theories regarding the pathogenesis of hiatal hernia: 1) increased intra-abdominal pressure forces the GEJ upwards into the thorax; 2) esophageal shortening displaces the GEJ superiorly into the thorax; and 3) widening of the diaphragmatic hiatus in response to congenital or acquired molecular and cellular changes in crural muscles or the connective tissue of the diaphragm facilitates the migration of the GEJ into the thoracic cavity. Unfortunately, evidence for these theories is hindered by deficient objectivity, inconsistency between reports, and overall lack of data. Presently, the strongest evidence for hiatal hernia formation is supported by few small studies reporting on structural changes in crural muscle or connective tissues that involve elastin, collagen, and matrix metalloproteinases. Conclusions: Despite its recognition centuries ago, the pathogenesis of hiatal hernias is under-researched and poorly described. To date, no single theory proves to be the definitive cause of hiatal hernia formation, and its pathogenesis appears multifactorial. Only a handful of studies have examined the relationship between molecular and cellular changes in crural muscles or the connective tissue of the diaphragm and the pathogenesis of hiatal hernias. Based on limited evidence, further investigation into the pathogenesis of hiatal herniasis needed to identify those at risk to develop this condition, to guide its prevention, and solidify a treatment paradigm such to minimize its recurrence.